BLOUNTVILLE — It’s time for the third annual “Farm to Fork” dinner in the center of “The Great Stage Road” in the Blountville Historic District. WHAT: The event brings local produce and meats to the table in a six-course meal prepared by culinary arts students from Sullivan Central High School. Students involved in last year’s event went on to win a statewide culinary competition for their efforts. 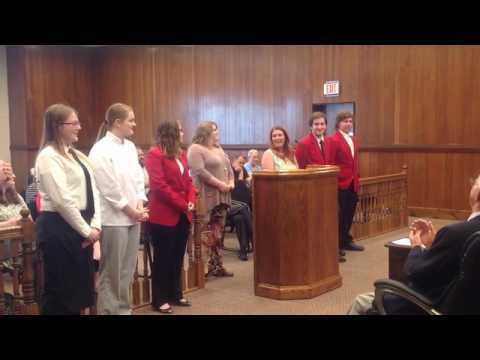 The students, their areas of competition and wins include: Amber Evans competed in restaurant service and took the gold medal; Hannah Ramsey competed in commercial baking and brought home the bronze medal; Allie Powell, Dylan Crowe and Conner Waye competed together in career pathway showcase and received gold medal recognition. WHEN: Thursday. A “social hour” begins at 5:30 p.m. and will give diners the chance to enjoy appetizers and wine from the local winery Corey Ippolito. The restored historic Old Deery Inn will be open. Dinner will be served open-air at a long communal table beginning at 6:30. Entertainment will be provided by bluegrass band Hickory Strings. HOW: The Central culinary students will prepare the food in modern kitchens included in renovations to the Ruteledge House beside the Deery Inn. The event allows the students a chance to utilize the skills they’ve been learning in a practical setting, Banks said, and do so with locally grown seasonal items. MENU: Beef Bourguignon (beef from local Indian Brook farm), roasted root vegetables, blue lake green beans. Appetizers will include butternut squash soup, bruschetta, dessert will highlight rosemary lemongrass almond sorbet. COST: $60 per person, with just a few tickets remaining. Call the extension office at (423) 574-1919.